Take in the stunning 15th- and 16th-century architecture in the first European city of the New World. 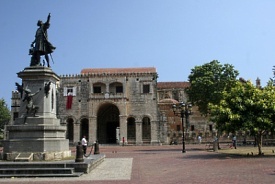 Along the cobblestone streets of the historic colonial zone, you'll find the first university, hospital and cathedral built in the Americas. The Malecon, a sprawling seaside boardwalk, is chock-full of entertainment venues. Beachgoers should head to Boca Chica, an idyllic strip of Caribbean beach with clear, turquoise water. Terminal Turística San Souci is located approximately fifteen minutes from the Las Americas Airport. Secured and covered long-term parking will be available directly in front of the San Souci Terminal. Driving directions from the Las Americas Airport - Take Autopista de Las Americas to the city of Santo Domingo, then take exit to Avenida España to the left, continue on Avenida España to the port of San Souci which is on your left hand, right in front of the navy base. Enter the port to your left at the main entrance.